How to draw face side view. This video shows you how to draw portrait of a female side view. 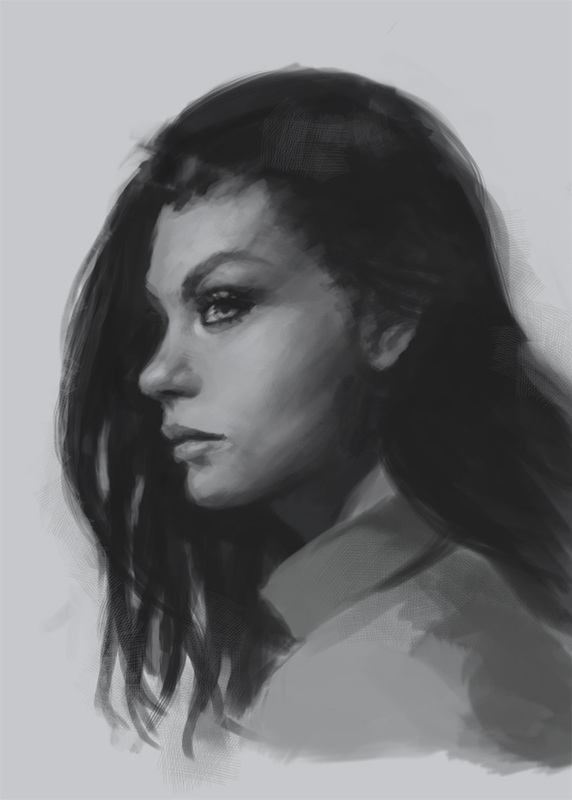 There are two video tutorials for how to draw face side view in this post. First one is digital. Second is in pencil on paper. You can choose from the labelled buttons under the video. Also I have step by step drawing tutorial if you scroll down more below. I usually start with basic geometry shape, for face, I use a circle but when you draw it out you should treat it as sphere. Then I draw a triangular shape below on one side of the sphere. Then I draw a horizontal line across the circle about half the height. Then the distance from the line to the bottom of the chin, halfway in between that you could establish the bottom of the nose. Then half way between the bottom of the nose to chin, you will find where you could place a mouth. Then on the horizontal line itself, you can draw another line underneath it parallel to the first one. And that would be the estimated distance of the eye’s height. Anyway here is a final piece of the sketch. Premium TUTORIALS: Over 2 hours of video with in depth drawing instruction. Below is the instruction how to draw people face side view step by step. 1) I start with an circle shape drawing (Same as the front), but this one I am going to draw a frontal shot. 2) Then I add a triangle shape in middle of the bottom to make a chin. But this time move the triangle all the way to the left (or right) *see arrow. 5) At this stage I begin to draw hair line starting from her forehead. Then I added her neck in. 7) The top of the head should be additional half a circle tall, measure from the top of the existing circle. Then I continue to tighten up the line draw a bit more. 8) It looks fin, then I clean up the construction lines. Done! Xia Taptara - Xia Taptara (黃曉聲 Huang XiaoShēng), currently a freelance concept artist for games and films, formerly a character concept artist for ArenaNet/NCsoft (GuildWars & Guildwars 2). I also work on various projects for Game of Thrones, Square-Enix, Paizo Publishing, Fantasy Fight Games, Disney Interactive, and many publishers & clients. I use Wacom Tablet Intuos and Photoshop CS2,3,4,5 to do most of my professional art work. I use pencil, pen, and traditional medium in my free time. I founded IdrawGirls.com (TheArtClasses.com) in 2007 to motivate myself to create more and better art. Also I get to draw and paint whatever the hell I want to. Hopefully I can inspired some young soul and old soul alike. *QUESTIONS & COMMENT: PLEASE POST THEM ON THE BLOG. Business Inquiry please e-mail me. Good job! and Congratz! Once you know how, it is easier than you think. Cheers! Using the same measuring method, but flip the side. You could probably implement it yourself since I’ve already show you one side. The side tutorials all face the left, is there any of a male facing right? Truly amazing! thanks for this! Wow, this was amazingly helpful! Thanks! Thanks! This was really helpful. TheArtClasses.com is an online art tutorial resources where artists can learn how to draw, to paint via our video tutorials on the internet. It was formerly known as idrawgirls.com but now we have grown up to TheArtClasses.com Whether you are beginners, novices, or intermediates you are welcome here to watch and gain your knowledge and up level your art skills. Waiting for Twitter... Once Twitter is ready they will display my Tweets again. ©2007-2015 CreativMobi LLC & Xia Taptara, DDMI All Rights Reserved. "TheArtClasses.comTM" and "idrawgirls.com" are trademarks used by CreativMobi LLC & Xia Taptara.